For the past few days I was experiencing a rather strange issue on my computer that made the mouse double-click sometimes when I did a single left-click. While that was not a problem all the time, it sometimes broke my workflow, for instance when trying to select a folder or deleting tags here in WordPress. The result was a different action than intended, the folder for instance was opened instead of selected. I suspected that it could be caused by two things. First a setting or driver issue, and second a hardware fault in the mouse’s micro-controller. Hoping that the issue fell into the first category, I began my research. First thing I remembered was that it was possible to change the double-click speed rate in the mouse control panel. After experimenting with the slowest double-click speed available I noticed that the issue was not caused by this setting. Next thing I checked were interfering background programs that may have caused the double-clicking issue, but that turned out not to be the issue as well. Which left me with a driver or hardware problem. I noticed at that time that Microsoft has a support page up about the issue. Troubleshoot mouse double-clicking when you single-click basically lists the same reasons for the behavior that I came up with. The company suggests to test the mouse in Safe Mode which I did not do. This could however be another option for Windows users who are experiencing the same phenomenon. My next stop were the Logitech mouse drivers. I decided to uninstall them to see if the default Windows mouse drivers were causing the same issue. After uninstallation and reboot, and some testing, I noticed that the problem had been resolved. While I can’t say with 100% certainty that the drivers were corrupt, I can say that uninstalling the drivers did resolve the issue which suggests just that. Since I did not want to stick to the default Windows mouse drivers, I decided to download the latest Logitech Setpoint mouse software and install it on my system to see if the issue remained resolved. Thankfully it did. A hardware defect would have been the last option if uninstalling and installing mouse drivers would not have resolved the problem. Users who have come to this point might want to try the MouseFix software before they send their old mouse in to have it repaired or shop for a new mouse. 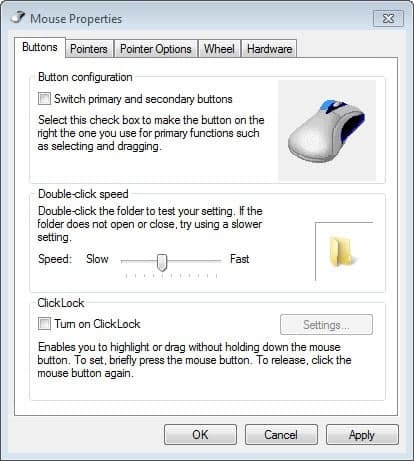 This software basically blocks the mouse from clicking a second time when the button is released. For my mouse, the problem seems to be that the switch isn’t “debounced” when you release the button — i.e. when you release it, it actually clicks again. Basically, the program intercepts “up” events for the left mouse button, and ignores any subsequent “up” events that follow within a very small time. The program is only compatible with Windows XP according to the author. I probably would have tested it under Windows 7 anyway to see if it resolves the issue.